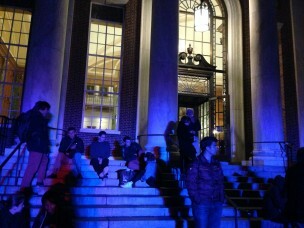 Students were evacuated from Olin Memorial Library this Sunday. Nov. 10 due to electrical damage in the stacks on the second floor of the building. The fire alarm sounded in Olin at approximately 7:30 p.m.
Office of Public Safety (PSafe) and Middletown Police Department (MPD) officers arrived on the scene soon after the firemen. According to students at the scene, two PSafe officers explained to those outside that electrical equipment in the stacks had been seriously damaged and that they believed it was either vandalism or someone’s attempt to inflict harm upon hirself. Neither MPD nor PSafe provided information regarding persons involved in the incident, and there have been no reports of injuries. MPD declined to comment on the situation. Bostick explained MPD officers’ presence at the scene. 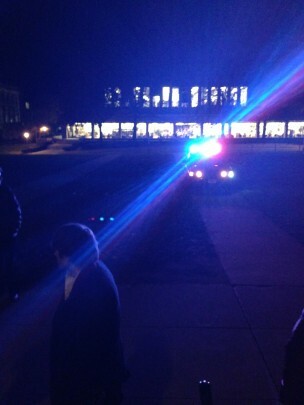 University Librarian Patricia Tully commented on the incident in an email to The Argus around 11 p.m. on Sunday. PSafe officers asked students who were gathered outside of the library whether they had seen anyone exit the building who looked distressed. “They came out, and then police showed up, and that’s when a PSafe officer came around to us and asked if we had seen anyone upset leaving the premises,” Welch said. According to Welch, PSafe officers allowed students to reenter Olin briefly to collect any items they had left inside but did not allow them to enter the second floor of the stacks. “Then they just let us back into the building very briefly to get our stuff, but they said that we weren’t allowed on the second floor or the [stack] area of 2a,” Welch said. Olin remained closed for the rest of Sunday evening and resumed its normal hours the next day. According to MPD, the investigation is ongoing. Additional reporting by Editor-in-Chief Lily Baggott and News Editors Tess Morgan and Miranda Katz. This article was originally published online on Sunday, Nov. 10 and was updated on Tuesday, Nov. 11.